Using a wide saute pan, melt the butter over a medium flame. Whisk in 4 ounces of the flour, until well combined. Leaving the heat on medium to medium high, whisk the butter-flour mixture constantly. Make sure to get all of the edges and corners so that nothing scorches. The color will gradually deepen as you go along. After about 15 minutes, I usually end up adding another ounce or two of flour, if it seems on the thin side. It usually takes about 20 minutes or so to get a color close to peanut butter, which is what you want. Scrape the roux into a bowl - stir a few times as it cools, so that it doesn't separate. No big deal if it does - you can reheat it to recombine if need be. Set aside. In a 5 quart heavy pot, heat the olive oil. Season the beef with the salt and pepper, begin browning it in the hot oil. You will want to do this in a couple batches, so that you get a good sear on the beef chunks. Set the browned beef aside in a bowl. Immediately, add the onions, celery and garlic to the hot pan, and stir around. Lower the heat slightly and continue to stir for a few moments. Carefully add the bottle of Guinness to the pan - it will foam up some and let off a lot of steam, so don't burn yourself. Stir, and scrape any browned bits from the bottom of the pan. Stir in the tomato sauce, beef broth, water. Bring to a simmer, lower heat a bit, cover the pot, leaving the lid slightly askew so that it doesn't sputter all over the stove. Cook until the beef is tender - about 2 hours, but it might be longer. Taste the broth, and add some salt and pepper if it needs it. Stir in the potatoes and carrots and cook about 15-20 minutes, until fork tender. Stir in the peas. If frozen cook a minute or two, if fresh, cook about 5 minutes. Stir in the roux, one tablespoon at a time, letting each addition cook a minute or so to see how thick it gets. Keep adding the roux by tablespoonfuls until it is as thick as you like it - usually around 3 to 4 tablespoons is enough. 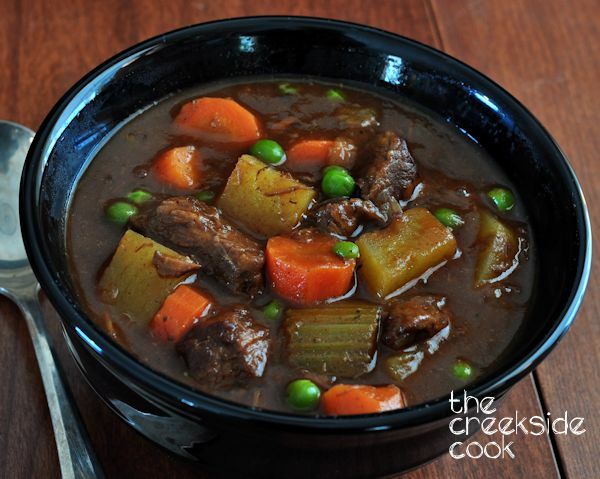 cook the stew at a low simmer for about 5 minutes more.